BlackBerry Desktop Manager coming to Mac | BlackBerry Blast! BlackBerry Desktop Manager is coming to a Mac near you come September. 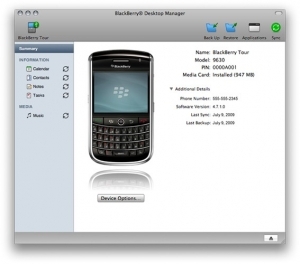 Inside BlackBerry has published several screen shots of the Mac version of the BB Desktop Manager with a release date of September. The Desktop Manager will support Mac® OS 10.5.5 and above. Users can sign up to be notified of the official release at the link below.